If there was a Christmas Bird Count for Christmas bird beers, you wouldn’t want me in your party. I searched high and low for a suitably bird-related Yuletide brew to review this week. I combed every shelf of my local distributor, my booze-addled noggin dancing with expectant visions of bottles festively adorned with Mistle Thrushes, Wreathed Hornbills, Star-spotted Nightjars – perhaps even a Christmas Shearwater. But I dipped on them all. I couldn’t even come up with a single Elf Owl. Humbug indeed. What I did find was Kinglet Bitter Draft Cider by ÆppelTreow Winery & Distillery, which is named for the Golden-crowned Kinglet (Regulus satrapa), North America’s smallest passerine. Even on a bottle lacking obvious Christmas frills, these hardy little songbirds of northern evergreen forests are perfectly evocative of midwinter to me – and any holiday is a good excuse to drink cider in my book. You don’t have to be an authority on the Anglo-Saxon language to figure out that ÆppelTreow means “apple tree” in Old English. This is likely the first and last time I’ll review a drink spelled with the “æ” grapheme (pronounced “ash”, I learned, as in the tree), but archaic orthography isn’t the only revivalist pursuit of this winery. ÆppelTreow is providentially located on the grounds of the Brightonwoods Orchard in Burlington, Wisconsin, which grows over 200 heritage varieties of apples on 4,000 trees, including several rare and hard-to-grow varieties almost entirely forgotten since Prohibition. Both orchard and cidery have been working together to counter this neglect by pressing these apples into service – quite literally – in ÆppelTreow’s excellent estate ciders. 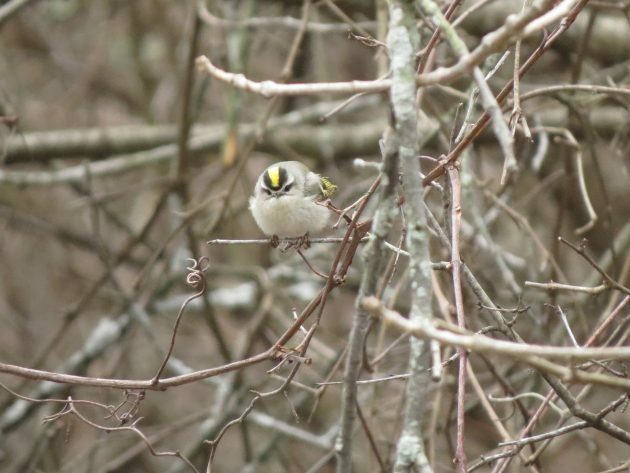 A Golden-crowned Kinglet (Regulus satrapa) along the Albany County Rail Trail in Albany, N.Y., holding still just long enough for the author to snap a photo. While a walk down any supermarket beer aisle in America will confirm that cider has made a remarkable comeback, mainstream versions – while refreshing in their own sweet way – tend to the cloying and bubbly, more like pomaceous soft drinks. This is because modern American apple production favors a mostly sugary crop, with a touch of tartness – just the thing for snacking or baking the proverbial American pie, but severely lacking in complexity. Traditional cidermaking in Europe relies on a mix of cider-specific apples – including sour and bitter varieties unsuitable as dessert or cooking fruits – to ferment blends that are closer to dry white wine than alcoholic apple juice. These strains are traditionally sorted by character into “sharps”, “sweets”, “sharp-sweets”, and “bittersweets”. The last of these are especially prized by cidermakers and are affectionately known as “spitters” due to unpalatable levels of tannins that render them inedible. Hardly a ringing endorsement for inclusion in the fruit bowl, yet these bittersweets offer a balancing astringency characteristic of the world’s great ciders, namely those of Normandy, Asturias, and the Midlands and West Country of England. With the help of the pomological preservationists at Brightonwoods and other orchards, ÆppelTreow and a new generation of American cideries are rediscovering these traditions – not to mention their own pre-Prohibition heritage. Many cidermakers will select a blend of complementary cider apples to balance sweet, sour, and bitter, but Kinglet Bitter Draft Cider is made from 100% bittersweet apples, an audacious mix of traditional English and French varieties. These include the high-maintenance Dabinett, Domaine, Frequin Rouge, White Jersey, and Muscadet Dieppe cultivars, as well as several others, all grown at Brightonwoods Orchard. ÆppelTreow uses a red wine yeast often used to ferment Sangiovese grape varietals in this cider to bring out the tannic character of these apples. Kinglet Bitter is a brilliantly clear cider, pale goldenrod in color, with a slight, spritzy carbonation that dissipates quickly in the glass. Tart green apple stands out in the bouquet, backed by tropical melon, hints of vanilla, and somewhat musty touches of hay and sulfur. The light, semidry palate is slightly tart with bittersweet apple flavors and a muted caramel apple sweetness, all brought into balance by a citrus pith bitterness. This balance between bitter and sweet gives way in the long, dry finish, ending with the bracingly tannic flavors of black tea. I will caution that Kinglet Bitter may be too assertive for drinkers unaccustomed to this sharply flavored style, and its exclusive blend of bittersweet apples might not be the gentlest introduction to these ciders. 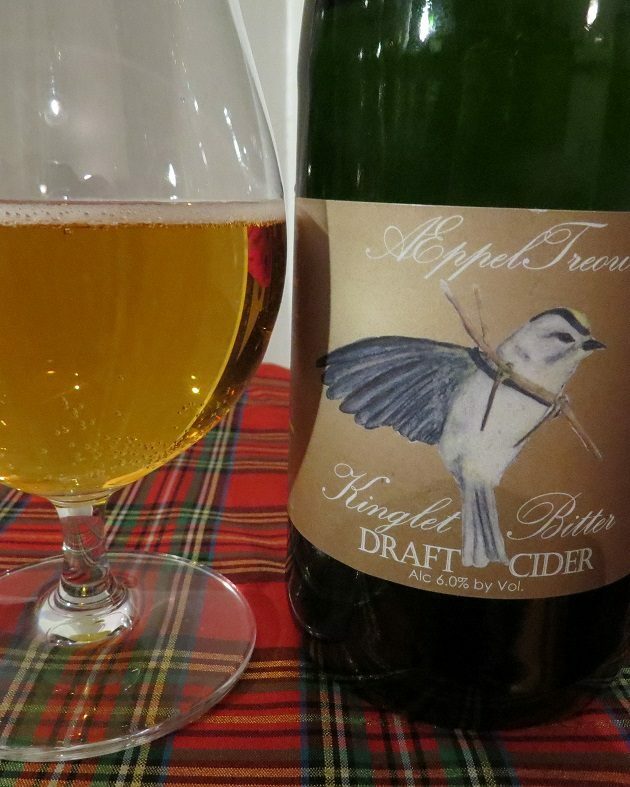 But AeppelTreow is one of several producers involved in the commendable revival of these long-forgotten apple cultivars, and they have an entire series of ciders named for songbirds, which I look forward to trying as I come across them. Bittersweet ciders like Kinglet Bitter should work well taking the place of dry white wines in food pairings. But rather than offer an obvious litany of dining choices, in keeping with the holiday spirit, I’d prefer to remind you that a worthy use of any cider is in that most seasonal of beverages: wassail. Perhaps best remembered today from the silly refrains of holiday caroling, wassail is nothing more than hot mulled cider with spices – often cinnamon, ginger, and nutmeg – and was drunk to ensure the health of the apple harvest in the coming year. Trusting in such venerable pagan rituals to produce a bountiful yield is all well and good, but even the less superstitious among us can do just as well supporting heirloom apple production by picking up a bottle of traditional cider such as Kinglet Bitter Draft Cider. Cheers, happy holidays, and good birding! Lots of fascinating info here, Tristan. Definitely going to look for this cider (though I’m probably amongst the imbibers new to this type of goodness). Love all the old and forgotten apple species, wish I could visit Brightonwoods Orchard in the fall. Thanks, Donna! (And I really need to remember to check my comments more often!). They don’t mention any bird-related ciders, but the link below to a Serious Eats article offers some more good information on the bittersweet style, along with some recommendations. I know I’ve seen Eve’s Cidery Bittersweet (from the Finger Lakes) at the Union Square market and other NYC-area venues. I also really like Aspall’s, a traditional English cider (not listed in the SE article). Cheers!